Synopsis : Incredible story of Marneen Lynne Fields a multi-talented SAG actress, pop singer, ASCAP composer, director, editor, executive producer, and former stunt-woman. For almost as long as motion pictures themselves have been around, the world has marveled and held their mouths open aghast at the work of those willing to risk life and limb to thrill their audience with feats of breath-taking bravery that helped make the magic of movie-making seem all that more real. While the past twenty years have seen amazing advances in computer-generated images and special effects which can make it seem as if anyone is dangling from a sky-high airplane, scaling the sheer face of a treacherous cliff or leaping from the top of a skyscraper without ever leaving the safety of the studio interior, the film pioneers from decades earlier enjoyed no such luxuries. The stunt performer though has for too long, often lived in the shadows. Unbelievably, while almost every other aspect of film-making is recognized with an Academy Award nomination, stunt performers are still all too often left to lurk in the shadows, while the stars they double for bask in the limelight and reap the rewards of others' hard work. No doubt this is due to a lingering desire to protect the illusion of film-making and help the audience believe it is the actors themselves doing all that spectacular daring-do. Until well into the 1960s, stunt performers rarely received any kind of public recognition, and if their name appeared on screen, it was usually hidden somewhere amongst the closing credits. There were, of course, always exceptions. Hal Needham broke out from the stunt arena to the director's chair, helming several hit films starring the late Burt Reynolds in the seventies, including the box-office phenomenon Smokey and the Bandit (1977) and the semi-autobiographical Hooper (1978), his notoriety even inspiring a stuntman action figure and toy play sets. Likewise, Australian stuntman Grant Page also became a popular household name in his home country, playing himself in the 1979 musical fantasy film Stunt Rock and making several appearances on popular Australian variety shows. Female stunt performers have been particularly overlooked and under-appreciated over the years. In the early days of Hollywood stunts, it was not uncommon for a male stuntman to don a wig and a dress whenever a scene called for a female star to fall off a roof or roll out of a speeding car. Fortunately, the tide in that area is slowly turning and women are at last receiving the credit they fully deserve for the daring feats performed in front of the camera in the name of entertainment. One such name that is finally being recognized for her impressive stunt career is that of Marneen Fields, a North Dakota native who in August 2018 was honored at the International Action on Film Festival in Las Vegas, Nevada, where she received the Legendary Stunt Award in acknowledgment of a career which began in 1976 and came to an unfortunate and abrupt end in 1991, not because of a stunt gone wrong but at the hands of an erratic young drunk driver who ploughed into the side of her car while she was on a routine drive through Studio City, California, almost severing the vehicle in two and causing massive internal injuries that came close to ending her life. When I landed the job on The Spell I had been a student at Paul Stader's Stunt School for almost exactly six months. I remember this because I told myself I would give my stuntwoman career six months if I hadn't gotten my SAG card within that time I would return to college at Utah State University and continue being a gymnastics coach in life. Within almost six months to the day, I landed The Spell and remained in Hollywood doing stunts and studying acting. At Paul Stader's Stunt School they trained me in how to do backward high falls from the rungs of ladders and platforms, but not from a swinging, hanging, dangling, slippery rope. My job was to stunt double the aerial acrobat who was doing twirls from the top of the rope with a harness, then loses her grasp and falls. She did her twirls and then we brought in a small mattress pad for me to land on my back on. I climbed the rope got into the same position on the rope she was in without the harness, spun myself around a few times, then fell backward from the rope letting go with my hands. When falling backward from any high surface the main thing to remember is to keep your eyes on your feet so your head is in the correct position for the landing. The body follows the head when flipping or falling and if you look back and not down at your feet, you can land on your neck and break it. Being a Class One advanced all-around gymnast, I was known for getting my stunts in one take without injury. This job was no exception, the fall was executed perfectly." "Work for Marneen on The Spell was quickly followed by jobs on the fantasy TV shows Wonder Woman, The Man from Atlantis, and an impressive stunt on Clint Eastwood's classic action film The Gauntlet (1977), where she doubled actress Samantha Doane as a tough biker chick who gets slugged off a moving train by Eastwood's Ben Shockley character. It was a striking and dangerous stunt but one which the fledgling performer took to with the enthusiasm and professionalism she would proudly display throughout her entire career. "I landed the job on The Gauntlet after receiving a call from Clint's stunt double and coordinator, Buddy Van Horn. He had been given my number and asked if I would be prepared to do this rather risky stunt. Though I was apprehensive about it, it was far too good an opportunity to turn down. I had about two weeks to get ready before I was due on location in Arizona, so I spent that time practicing in the playground at the local beach where I would stand up on the moving swings and leap off of them while they were still in motion then roll into the sand." Marneen continues to explain, "For the leap from the moving train carriage, all I had for protection was a small boy's football girdle and some knee pads strapped under a pair of grotty old blue jeans which the character wore. All movie stunts are serious and carry potential risks, but this one filled me with a strong level of anxiety in the lead-up to its execution. The screenplay called for me to be standing with my back to the open train carriage, causing me to exit going off blind. When Clint throws a punch at my jaw, I had to turn to my right and leap from the train, while trying to make it look as if my body had gone limp from the punch. The scary part was because the train was in motion until I spun around and made the commitment to fall, I had no real idea of exactly where I would land. Clint and Van Horn had blocked out my scene with me and gone over the approximate area where I was expected to fall. I was warned by both that I must make sure my body moved in the same direction the train at all times (hard to do when you're going off backward with a half twist), or I could be thrown back under the train track wheels and squashed to death. Fortunately for me and posterity, the stunt came off without a hitch, though I was a bit bruised and winded and worse for wear once I hit the hard desert floor, and I only just missed landing on a rusty old Coke can which had been placed on the sand by the props department." "About a week after I got back from filming in Arizona, I received a personal phone call from Fritz Manes, who was Clint Eastwood's childhood friend and producer. Fritz told me he was leaving me a drive-on pass at the Warner Brothers Studios front gate and to come by the office to pick up photographs he had for me. When I arrived at the studio and opened the door to Malpaso Productions, there was Clint Eastwood, standing alone in the reception area of the outer office. I kid you not; he was in a state of complete calm and deep thought, and I imagined he was meditating or if it was his way of running and remembering lines. I wondered how he would react since I had entered without knocking first, but he was fine as he shook my hand and I reminded him I was the girl he had punched off the moving train." "Yes, Fritz isn't here right now," Clint replied. "But he has some photos for you. Come in here, Fritz left them on his desk." "He handed me a huge manila envelope with my name written in black swastik pen on it. Once again, he shook my hand and complimented me on the great stunt I did, as he opened the envelope and showed me the still photos which captured my entire sequence in a set of 8X10 shots, which I still possess and treasure to this day. Clint Eastwood was the most talented director and producer I ever worked with, no doubt. After my stunt had been completed, and I lay winded and nearly knocked out on the hot desert floor, pain tearing at my left heel, I looked up and wondered how I would get out of that sand trap as the train had vanished. A few moments later, the train came rolling slowly back down the track, Clint hauled himself off the train as soon as it came to a halt, ran over and picked me up in a giant hug. "I LOVED IT!" he exclaimed. In 2010, Clint contacted me and was nice enough to send me a copy of a 1988 issue of Star Magazine, which ran an article on me with the headline "Clint Eastwood's Hug Changed My Life." With the success of The Gauntlet at the box-office, Fields' stunt career expanded exponentially with work on a notable roster of episodic television shows, many of which developed large cult followings like Battlestar Galactica, Fantasy Island, The Fall Guy, Quincy M.E., Lou Grant, and many others. On the big screen, she played a passenger who got thrown out of a train derailed by a swarm of killer bees in Irwin Allen's The Swarm (1978), doubled for Shirley Jones in Beyond the Poseidon Adventure (1979, another Irwin Allen disaster epic) and was cast as a member of the US Olympics team that got tossed about in mid-air in Airport '79: The Concord(1979). She also got to grapple with Freddy Kruger (Robert Englund) and his razor-sharp steel-fingered glove when she stunt-doubled Kim Myers in A Nightmare on Elm Street 2: Freddy's Revenge (1985). Other notable directors which Fields worked for include Stanley Kramer on The Runner Stumbles (1979), Joe Dante on The Howling (1981) and Joel Schumacher on The Incredible Shrinking Woman (1981), while the range of female talent she has doubled for include such names as Priscilla Presley, Jayne Seymour, Dee Wallace, Melanie Griffith, Karen Black, and Michelle Phillips. While keeping busy with the stunt work that kept her constantly in demand, Fields continued to pursue straight acting roles, playing a heartbroken diner waitress in the 80s TV crime show Riptide and a Co-starring role as the unfortunate victim of a chemical lobotomy in the cult horror film Hellhole (1985). But it was her career as one of Hollywood's genuine pioneering stuntwomen that came squarely into focus on August 24, 2018, at the Palms Hotel in Las Vegas. 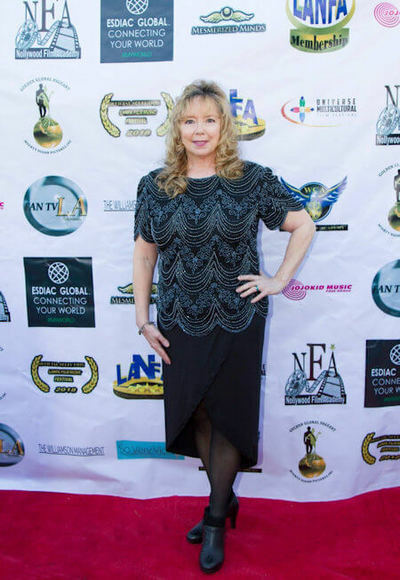 As part of the 14th annual International Action on Film Festival, Marneen received a rousing standing ovation and a chorus of cheers and whistles as she took to the stage to be presented with the Legendary Stunt Award in recognition of her huge body of work. To paraphrase a famous quote from Neil Armstrong, it was both a small step and a giant leap, both for Marneen personally and for stunt performers in general. With such notable names like Helen Mirren recently declaring that stuntmen and women deserve their own category at the Academy Awards, one can only hope that stunt performers may finally be ready to receive the widespread respect and credit due, both for those who continue to work in the field today and those like Marneen Fields-once-coined "Hollywood's Original Fall Girl" by J.P. "Bill" Catching and the Stuntman's Association - who helped blaze the trail for them. 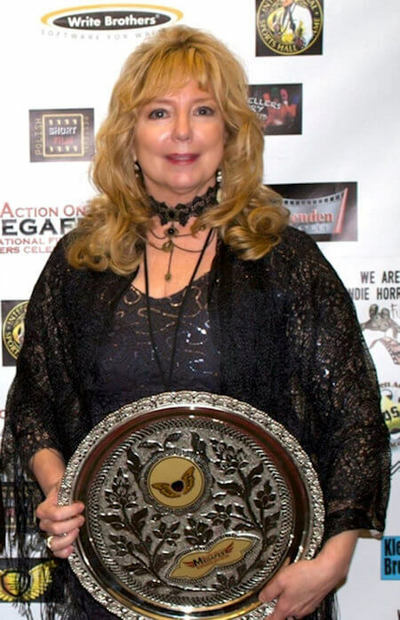 On August 24, 2018, in Las Vegas, Nevada Marneen Fields received a Legendary Stunt Award from the International Action on Film Festival for her contributions as a stuntwoman and stunt actress in over 100 feature films and prime time television shows 1976. It was a lifetime achievement award and emotional evening for Marneen. Seated at the back of the room she kept telling herself she'll know when it's her turn to take the stage because they will show her showreel showing highlights from her career. As host and producer of the Action on Film Festival Del Weston stood at the microphone giving a detailed introduction about someone, Marneen did not understand the lengthy introduction was about her when the entire audience rose to their feet in applause. Eye on Entertainment reporter, Traci Lynn Cowan with her photographer Dan Kennedy let Marneen know Del Weston was introducing her, and that it was time for her to take the stage. All Marneen could think of as she stood up to take the stage was that being 3/4 deaf and sitting at the back of the room she didn't hear a word Del Weston said about her. As she walked through the crowd, seeing only the backs of people applauding her, it was like nothing she had ever experienced in her life, and it took her breath away. Once she arrived at the steps to the stage, she could hear the creator of the Legendary Stunt Awards, Dr. Robert Goldman reading highlights about Marneen's career and listing the titles of some films she's appeared in and some of the famous actresses she had done stunts for through the years. After Del Weston said, "Marneen Fields is a Legendary Stunt Woman!" Dr. Robert Goldman said, "Wikipedia lists Marneen Fields as one of the most prominent stuntwomen and stunt actresses of the 1980s. They list her as a great gymnastic talent, an actress, and as a stuntwoman. The world has seen her step into the shoes of 100 of the worlds most famous actresses to perform death-defying feats. Some of the shows she's appeared in and actresses she's doubled are, Jane Seymour Battlestar Galactica, Priscilla Presley, The Fall Guy, Shirley Jones Beyond the Poseidon Adventure, Michelle Phillips The Man with Bogart's Face, Morgan Fairchild Time Express, Belinda Montgomery The Man from Atlantis, Mary Crosby Dynasty, Samantha Doane The Gauntlet, Linda Purl Matlock, Natasha Richardson Patty Hearst, Karen Black Police Story - Confessions of a Lady Cop, Linda Hamilton Murder She Wrote, Melanie Griffith She's in the Army Now, Tovah Feldshuh Terror Out of the Sky, Dee Wallace The Howling, Kim Cattrall The Hardy Boys/Nancy Drew Mysteries, Barbara Hershey From Here to Eternity, Heather Menzies Logan's Run, and many more. Please welcome Marneen. As Dr. Robert Goldman read her credits his assistant, the amazing Michael DePasquale Jr. opened the large black velvet case and showed Marneen her gorgeous Olympian styled Legendary Stunt Award disc. Marneen took the stage to more applause and whistles. She gave a time capsule of the events that lead her to become a recognized champion that evening. In all the excitement she forgot to mention her major hearing loss, one of the biggest obstacles she's overcome through the years to achieve respect and recognition in her film and music careers in the entertainment industry. Marneen Fields - Photo 5 - On August 24, 2018, in Las Vegas, NV Marneen Fields received a Legendary Stunt Award from the International Action on Film Festival for her contributions as a stuntwoman and stunt actress in over 100 feature films and prime TV shows since 1976. 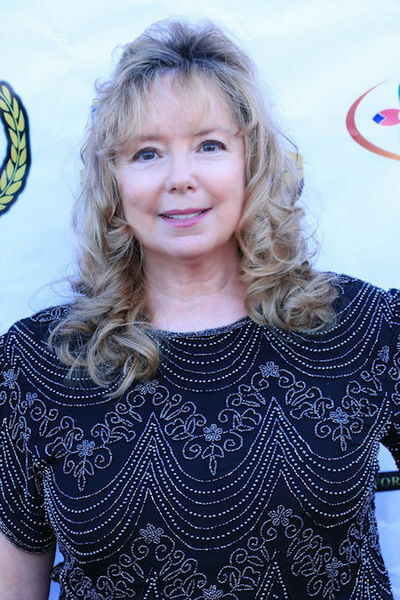 After Marneen thanked Del Weston, Robert Goldman, and the Action on Film Festival, she talked about her early childhood and how she was a sickly child born with emphysema and an enlarged heart. By age nine she had grown into her heart and was winning first place in all the relay races at her elementary school, being best known in her neighborhood for walking on her hands around the block as the neighborhood kids followed her to see how far she could go. In 1973 Marneen Fields was one of three women in the United States to receive an athletic scholarship in gymnastics to Utah State University, and she made sure to mention that they didn't give athletic scholarships to women in gymnastics back then. She became the top class one all-around gymnast for USU ranked third in the nation on floor exercise and balance beam. In1975 Marneen had a terrible fall off the balance beam injuring her right ankle and underwent an ankle reconstruction surgery where a calf's tendon was inserted into the ankle in place of the ligaments. A calf's tendon that remains in her right ankle to this day, and that she performed all the stunts with. She talked about how the ankle reconstruction surgery forced her to quit college and move home to Ventura, California with her parents believing everything was over for her now she could no longer compete in gymnastics. Then in 1976, she was discovered by famous stuntman Paul Stader, owner of Paul Stader's Stunt School and by 1977 she was one of the top stuntwomen in the world. In 1985 they coined her Hollywood's Original Fall Girl, and she received a Fall Girl license plate by J.P. Bill Catching and the Stuntman's Association. Then she talked about how she was discovered as an actress by Victor French (Highway to Heaven and Little House on the Prairie). By the late 1980s, as she was on the verge of breaking as a famous actress, she had a near-fatal car accident when a boy who worked in a textile wrapping company ran a red light and took her car in half. It took Marneen a year to walk again as she underwent twelve years of abdominal operations. Marneen says, "Dr. Goldman talks about persistence, I got back onto my feet. I never thought I'd get back onto my feet to become an award-winning pop-rock singer-songwriter, and ASCAP composer today. I'm still acting, I'm producing, I'm directing. I've had two nominations for my music videos in the Action on Film Festival. (As the crowd applauded Marneen continues), I thank you so much. More than anyone will ever know I will hold what he has created, the most gorgeous award I've ever seen, that is my gold medal in the Olympics in gymnastics! I'm very touched. I've cried and cried. That's about all I have to say. Thank you." The crowd rises to their feet again in a second standing ovation for Marneen Fields and her amazing story and heartfelt acceptance speech at the microphone. 2018 has also seen Marneen Lynne Fields receive a major win for one of her new singles, I'll Never Kiss His Lips Again winning Best Single of the Year from the LANFA Nollywood Music Awards on August 5, 2082. On August 24, 2018, her music video Shadows received a Best Music Video of the Year nomination in the International Action on Film Festival. In July two of her music videos, Release My Love and Shadows received nominations for Best Music Video of the Year in the Grand Indie Wise Convention in Florida, and on July 15, 2018, Marneen's new single, Standing Ovation! You're the Star! received a nomination in the Atlas Elite Entertainment Awards for Best Pop Single of the Year. 2019 will see Marneen Lynne Fields publish two books about her life, her true story, Cartwheels & Halos and Rollin' with the Punches, her filmography. She's also just published an Ebook titled, The Illusive Craft of Acting: An Actor's Preparation Process available on Amazon and Smashwords. Today, Marneen Fields divides her time between Los Angeles and Melbourne, Australia. Apart from her ongoing career as a singer/songwriter, she remains busy developing screenplays and working on her autobiography Cartwheels & Halos, which she hopes to see published in 2019. 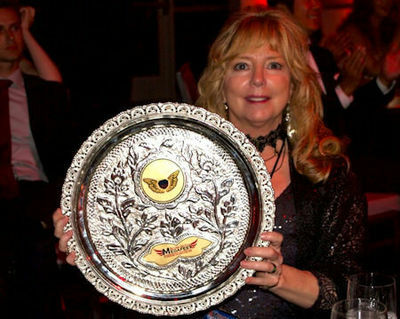 Marneen Fields WINS a Legendary Stunt Award (2018). Marneen's new Ebook The Illusive Craft of Acting: An Actor's Preparation Process, an Ebook by Marneen L Fields, (Amazon and Smashwords).